16. Comments: Advanced clocks 1 hour @ 0500Z to conform with +3 time zone. ETA Arica, Chile 261100Z Nov 03. So Roger Revelle thought, and as I spend my last night on the ship that bears this remarkable man’s name I pause to reflect on my voyage of discovery. I have learned a great deal while I have been at sea; from the duties of a chief scientist and how to deploy a buoy to how aerosols are involved in precipitation in the atmosphere, and so much more. The experience of being hundreds of miles from shore with thousands of meters of water beneath you is indescribable. In my last log I wanted to talk about my impressions of oceanography and a little about the history of the vessel I am traveling on and what makes it so special. The Research Vessel ROGER REVELLE is named after one of the most respected Oceanographers in the field. He was also a graduate of Scripps Institution of Oceanography and eventually, the director. I want to share a little bit of Roger Revelle the man and also the ship. “The ocean holds me in an enduring spell. Part of the spell comes from mystery – the fourfold mystery of the shoreline, the surface, the horizon and the timeless motion of the sea. At the horizon, where my line of sight touches the edge of the great globe itself, I watch ships slowly disappear, first the hulls, then the tall masts bound on voyages to unknown ports 10,000 miles away. From beyond the horizon come the waves that break rhythmically on the beach, sounding now loud, now soft, as they did long before I was born and as they will far in the future. The restless, ever-changing ocean is timeless on a scale of life, and this also is a mystery. Being an oceanographer is not quite the same as being a professional sailor. Oceanographers have the best of two worlds – both the sea and the land. Yet many of them find it extraordinarily satisfying to be far from the nearest coast on one of the small, oily and uncomfortable ships of their trade (the RV REVELLE is none of these things! ), even in the midst of a vicious storm, let alone on those wonderful days in the tropics when the sea and the air are smiling and calm. I think the chief reason is that on shipboard both the past and the future disappear. Little can be done to remedy the mistakes of yesterday; no planning for tomorrow can reckon with the unpredictability of ships and the sea. To live in the present is the essence of being a seaman. Revelle was considered as the director who took the institution to sea. He supported and encouraged and personally participated in many oceanographic voyages and deeply believed in the value of personally collected data. An oceanographer had to spend time in the ocean he studied. Even today with our satellite data and computers the data that is being collected at sea by oceanographers is absolutely irreplaceable. Oceanography is one of the few fields where you can still experience the adventure of exploration and discovery. There is still so much we do not know and for a young person is is an exciting and challenging field. With our new technology we can probe and explore more deeply and with greater accuracy than ever before, but still we need to go to sea to collect our data. I hope that in the interviews with the scientists and crew of the REVELLE I have been able to share a little bit of the excitement and enthusiasm that these people have for what they do. Everyone I spoke with shared with me that they really enjoy the idea that their jobs, either the actual science itself or the support of the science makes them feel that they are part of a real contribution to our future knowledge. The spirit of Roger Revelle lives on in the ship that bears his name and in the scientists, like Dr. Robert Weller, who follow his dream. There is still so much left for the young oceanographers to come and I look forward to sharing this spirit of exploration and discovery with my students. 16. Comments: Deployment of surface drifter array #4 in progress. NOAA Climate Studies of Stratocumulus Clouds and the Air-Sea Interaction in Subtropical Cloud Belts. Today we are still underway and I am going to talk about another science group that is onboard and how their research is related to the Stratus Project. We are presently located along the coast of Northern Chile and I just finished interviewing scientist Chris Fairall with NOAA’s Environmental Technology Laboratory in Boulder, Colorado. A group of 4 ETL scientists are participating in a study of oceanography and meteorology in a region of the ocean that is known for its persistent stratus clouds. The Woods Hole Oceanographic Institution (WHOI) has maintained a climate monitoring buoy at this location for the last 3 years. Each year they come out to take out the old buoy and replace it with a brand new one with fresh batteries and new sensors. A year in the marine environment takes a toll on the toughest instruments. This is a special buoy which is festooned with atmospheric sensors to measure air-sea fluxes and with a long chain of subsurface instruments to measure ocean currents, temperature and salinity. If you go to the WHOI website ( http://uop.whoi.edu/stratus) you can read about this project and see the data from the buoy. The data are transmitted via satellite everyday. WHOI removed the old buoy on Nov 17 and put in a new one on Nov 19. Why are these clouds so important? Because the earth’s climate is driven by energy from the sun and clouds dominate how much solar energy reaches the surface. On average, almost 40% of the sun’s energy is reflected back into space and half of that is reflected by clouds. In the cloudy regions more than 60% of the sun’s energy can be reflected by clouds. The surface temperature of the ocean is a result in a near balance between solar heating and cooling by evaporation and cooling by infrared (IR) radiation from the water surface into the sky. The global circulation of the atmosphere and ocean are driven by region differences in this net heat input, so clouds have a direct effect on the winds and currents. Cloud effects on the ocean surface energy balance are very tricky because clouds affect both the solar flux (i.e., by reflecting energy back into space) and the IR flux. It might surprise you, but the sky is ‘warmer’ when there are low clouds present than when the sky is clear. Think about those cold clear nights in the winter and note the ‘cold’ often appears with ‘clear’. More specifically, the IR radiation coming down from the sky is higher when clouds are present than when skies are clear. In the tropics and sub-tropics, the solar reflection cooling effect of the clouds is much stronger than their compensating IR warming effect. Thus, these stratus clouds play an important role in keeping the subtropical oceans cool. The region we are studying is one of 5 stratus regions around the globe (west coast of U.S.. west coast of S. America, west coast of S. Africa, west coast of N. Africa/Europe, and the west coast of Australia) that occupy vast expanses of ocean. Both of the pictures I attached to this log show the stratocumulus clouds in this region. Each of these cloud types has about the same area-average liquid water content but, because of the horizontal distribution, vastly different radiative properties. The physical processes that lead to these different forms are one of the objective of the ETL studies. Clouds are formed through various related mechanisms; most involve cooling air to below its dew point temperature so droplets condense ( i.e., clouds are suspensions of liquid water drops with typical sizes of about 10 micrometers radius). Convective clouds are associated with cooling in strong updrafts; fog and many mid-atmospheric clouds form when an atmospheric layer cools by IR radiation. The stratus clouds we are studying are quite different. The key elements are a strong atmospheric cap that traps ocean moisture in a fairly thin ( about 1 km high) boundary layer over the surface. The stratus clouds occupy the top of the trapped layer from just below the cap to down the altitude ( cloud base height) where temperature and dew point just meet. Below that, the relative humidity is less than 100%. The ‘cap’ on the atmosphere boundary layer is warm/dry air descending in subtropical regions, particularly on the western boundaries of continents. This descending air is actually driven by deep convection in the tropics. To meteo- nerds this is an amusing paradox – cool stratus clouds off Chile and California are essentially caused by thunderstorms near the Equator. Clouds are a pain to study because they are so inaccessible. To get into clouds with sensors you need a really tall tower, a tall building or an aircraft. Most of these are hard to come by 500 miles from land. Thus, most climate studies of clouds rely on remote sensing methods using satellites and surface based sensors. ETL has deployed a suite of remote sensors on the R/V Revelle to study clouds from the bottom. The showcase sensors are a special high frequency cloud radar and a 2-frequency microwave radiometer system (this system is the attached picture of the large, white van). This is the 6th time such sensors have ever been deployed from ships and only the second time to a stratocumulus region. The first time was to this same spot in 2001; see the web site: http://www.etl.noaa.gov/programs/2001/epic for information on that cruise. The radar has a wavelength of 8mm, which is so small that it is sensitive enough to receive detectable signals from scattering cloud droplets. With this device the ETL group can determine profiles of cloud properties ( such as size of the droplets) through the entire cloud. The microwave radiometer uses the emissions from the atmosphere at 2 frequencies ( 21 and 31 GHz, or wavelengths of 14 and 9mm) to determine cloud base height and, most importantly, we also measure IR and solar radiative energy reaching the surface. Instead of just looking at the cloud, they collect megabytes of data every minute. The beauty of this set up is that they can simultaneously measure the effect the clouds have on the surface energy budget of the ocean and the cloud properties ( liquid water content, thickness, soiled versus broken, number of cloud droplets per unit volume) that go with the radiative effects. The ETL group are only out here a few weeks each year, but their detailed measurements provide vital information to interpret long-term continuous time series measured by the buoy or inferred from satellite overpasses. We are surveying for a location for the PMEL Tsunami buoy and the weather is beautiful. Due to our heading we have lost internet connections periodically. The food on the REVELLE is really amazing; last night we had steak and King crab for dinner and a group of the crew and science party met in the lounge to watch a movie. Card games and cribbage are popular in the dining room and some of us just sit outside and enjoy the sunsets. I’m going to sleep early as I have the late watch. Today we are underway to the next location which is the area of deployment for the PMEL Tsunami buoy. I want to talk a little bit about what a Cruise Plan is and why you need one. I have attached a picture of our latest cruise plan from Dr. Weller. He had a very nice one ready to go well before we even boarded the ship and everyone in the science party (yes, including me) was given a copy. Consider this the “game plan.” It can and does change due to weather or other unforeseen factors and it is very important that the Chief Scientist makes sure that it gets revised as it is necessary to make sure we will have enough time for all of the different deployments and data collections that are planned or to modify as needed. These cruises are very expensive; from the cost of the ship itself, to the equipment and science party, to the value of the data collected. For the Stratus Project, (http://uop.whoi.edu/stratus) this is the big event of the year, everything leads to this moment when the buoy and instruments are recovered and the new buoy is deployed. Any mistakes made now could potentially result in the loss of data for a whole year. This brings to mind the importance of really good planning for an expedition of this magnitude. The Chief scientist has to know how much time he/she need to accomplish their project, build in a few days extra in case of weather or delays, know how much equipment to bring for the project including spare parts (just in case Murphy’s Law kicks in…which it does more often than not!). Redundancy of equipment is essential from the project itself to the ship which has to be able to repair while on the move with extra parts it has with it or to make a part as needed (yes, they can do that!). There are no stores out here, if you forget it or run out, you’re out of luck! That means a year’s work and a big grant could be in danger! Prior planning is not just a good idea, it is essential and a good Chief scientist has foreseen almost any extenuating circumstance. There is also the importance of remaining calm and being able to come up with creative solutions to problems in the middle of an important project. Everyone is watching the Chief scientist and takes their cues on behavior from him/her. If something happens, they watch to see how he reacts. The technicians and research associates in a science party need to work well together as they may be at sea for long periods of time (could be a month to several months) . When you are at sea, 8 hour days doesn’t mean much. You work whenever there is work to do, deployments or data collection can and do happen around the clock. The time out here is expensive and data collection is sensitive to many different parameters. You work seven days a week, but everyone is doing the same and it builds a sense of comradeship to be sharing the work. Scrabble and Cribbage tournaments in off time are a big event. Even though they work really hard out here, they all realize the value of what they do and they are here because this is what they wanted to do in life: science. It is pretty exciting too, you never know what you might see and no matter how long you have been going to sea or how many cruises you do a year, it is still exciting to see whales or dolphins, and beautiful sunset still makes you pause. 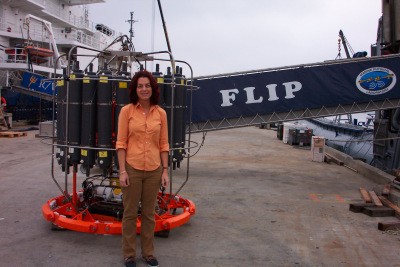 Sometimes, as in this cruise, there may be more than one project and multiple scientists. However, there has to be a Chief scientist to determine priorities and the scheduling concerns so that everyone gets their data, specimens or deploys their equipment. To be a chief scientist you need to be detail oriented and having workaholic tendencies (at least during a cruise) doesn’t hurt! This does not mean they don’t have fun after all the hard work is done. Dr. Weller plans a few days at the beginning and end of a cruise after all the work is done (his group have been working everyday for a month!) to see some of the sights and enjoy the culture of the ports they visit. Sometimes these days get used for unforeseen circumstances, like extra time for loading, unloading and shipping. Actually that’s why they are put in there. But if everything gets done in a timely manner, there is a little bit of down time. He even organizes the tours and had guide books for each of the ports we visited (it’s that detail oriented thing I mentioned!). He understands the value of appreciating the quality of work your group produces. Many times the group will consist of one or more grad students under the Chief scientist and this is how they learn to be a chief scientist. It is not a class they take as part of their Ph.D. program, it comes from observation and personal experience. So mentoring is another important component of the job description. Seeing the bigger picture is also part of the equation; Dr. Weller really wanted a Teacher at Sea as part of this cruise to help share this experience with younger students and hopefully give a small peek at real scientific research to both k-12 teachers and students. Many scientists today see the value of this and NOAA has been doing this for 13 years. Woods Hole Oceanographic Institution has some outstanding education outreach programs such as “Dive and Discover” (check out that WHOI web site!) Scripps Oceanographic Institution has additional resources at the SIO web site. Please check out the attached picture of the latest cruise plan, as well as a picture of one of the cups that the science party sent down to 4000m on the CTD. I think the sentiment on the cup is a good reflection of the esteem in which they hold Dr. Weller and I wholeheartedly agree! 16. Comments: On station in vicinity of WHOI buoy. We are still in the vicinity of the WHOI buoy and will stay here for 24 hours to check and compare the sensors on the Stratus 4, Stratus 3 and the ship. We will then leave for the area of deployment of the Tsunami buoy. We will do 2 CTD casts before leaving. During our cruise we have been deploying radiosonde weather balloons and the ETL group has been collecting cloud data. I am going to give a brief description of the ETL Cloud Radar and Radiometer Package that they brought with them and are using to collect their data. Clouds play vitally important roles in climate and and water resources by virtue of their ability to transform radiant energy and water phase in the atmosphere. NOAA?ETL uses microwave and infrared radiometers for ground based cloud observations. ETL designed and is using the Millimeter-wave Cloud Radar (MMCR). These radars are intended to operate in remote locations and for field experiments. The radar is joined in a sea container by a dual- channel microwave radiometer (MWR) and a narrow-band infrared radiometer IRR). Simultaneous data from these instruments provide the input for retrieving microphysical features of the overlying tropospheric clouds. Primary uses: Monitoring vertical water vapor path and liquid water path. Primary uses: Sensing presense of cloud overhead, estimating base temp. of optically thick clouds. Collectively, the instruments are called the MMCR Package. Each observes the senith and does not scan, hence, the system is a vertical profiler. This is the second time that ETL has come out with the Stratus Project and it is hoped that through additional funding it will become a permanent partner in this long term study. ETL is doing these measurements and calibrations not only to verify some of the meteorological data collected from the sensors on the WHOI buoy, but also to do profiles on the cloud structures of the stratus clouds in this area to campare the data to the mathematical models. They are also using the data to compare and calibrate the mean and the flux calculations used in the Stratus project. ETL came out during the second year of the Stratus project to do a similar survey. The WHOI science group are doing their calibrations and measurements all day and the ETL group continues to collect data. PMEL/NOAA is waiting to deply their buoy at the next site. The weather is beautiful, warm, sunny, some clouds (stratus!) I am doing a lot of reading and talking with different science groups and crew members to prepare for interviews. Tonight we will be interviewing the ETL group about their cloud studies. E-mail will be sporadic from now on as we will be on heading that will not allow us satellite communication. We will turn for 30 minutes once a day to send out and receive e-mail. Tomorrow and the day after will be travel days to the Tsunami deployment site.We still have a couple of boobies following us….obviously hopeful that we will toss out another floating cafeteria for them. Learning a great deal about how these large oceanographic research vessels run. They are all owned by different facilities but they are assigned by one entity that schedules all of the science cruises for best efficiency of the vessels. The scheduling entity is UNOLS. So a Scripps scientist could be schedules to go out on a Woods Hole vessel one year and a NOAA vessel the next based on the science needs for size, equipment and location. This means that for example the REVELLE came into its home port of San Diego in September and picked up a science group; did their leg, dropped them off in Manta, Equador, where we met them and loaded equipment for our project and left. We will arrive in Arica, disembark, ship the equipment back to its various labs and the new science party will board and leave for their project. This will continue until sometime in April until REVELLE briefly returns to San Diego, where it will pick up another science party and go out again. It may only come into San Diego two or three times a year. These ships are almost constantly out working and the crews fly in and out of various ports to meet the ships and change crews. 16. Comments: Survey in progress. Today the REVELLE spent the day surveying an area for deployment of the STRATUS 4 buoy. We traveled 50 miles from the STRATUS 3 site with the hopes of getting out of the GPS mapped area of the fishing boats to prevent the fouling of the instruments with fishing line. Fishing boats target buoys as they become areas of fish aggregation in the open ocean. The ship took a zigzag pattern most of the day surveying the bottom topography ( see photo of survey and course). Dr Weller explained that he needed to find a relatively long, flat area on the bottom as we will be underway during the deployment of the instrumentation and we need to travel is a straight line to lay out the instruments. Due to the wind direction we will not be exactly following the straight line of the flat bottom area, but coming in at a slight angle. Jeff Lord and Jason Smith of Woods Hole Oceanographic Institution, Upper Ocean Processes group spent the day preparing the cables, laying out the instrumentation and spraying various parts with de-fouling paint. It was a very detailed all day procedure. Moving the buoy and other heavy instrumentation requires good skills in rigging and crane operations. The Upper Ocean Processes Group of which Dr. Weller is the head, are highly trained and make this complicated and potentially dangerous work look so easy. This is part of the job as an oceanographer that you don’t learn in the classroom, but are taught by watching and doing with another professional. The STRATUS 4 buoy will have a slightly different instrumentation than the STRATUS 3. The Seacat current meters with the rotating fan blades that were fouled with the fishing line will be moved deeper on the mooring and acoustical current meters will be moved to a more shallow spot. Unfortunately the Seacats are more accurate than the acoustical current meters, but they can’t collect data if they are fouled. The acoustical meters have no moving parts to foul. Dr. Weller will also be comparing and calibrating some of the radiation sensors with Dr. Chris Fairall of the ELT group using they cloud radar data. Deployment will begin after breakfast (approx. 7:45 am) tomorrow morning. I didn’t help very much with the science activities today other than to stand watch and take hourly temperature readings. Dr. Kermond and I spent the day filming several interviews. We toured the extremely impressive engine room on the R/V REVELLE with the Chief Engineer Paul Mauricio. Please check out our tour on the web. We also resumed our “Fantail Interviews” with Jason Tomlinson, Meteorologist from Texas A&M who is doing aerosol research out here with us. I will spend an entire log in the next couple of days on Jason’s aerosol research. Tonight on the Fantail we will be interviewing Dr. Chris Fairall of NOAA Environmental Technology Laboratories and NOAA/PMEL Tsunami buoy deployment group, Mike Strick and Scott Stalin. be sure to tune in:)I need to work on my survey of good sunscreens and/or stronger aloe vera lotions! The boobies from the STRATUS 3 buoy are following us wanting to know when their new “cafeteria” will be installed. Much to do tomorrow, it will be another long day doing the deployment and I am very interested as to how they are going to get that 9000 lb anchor in the water! 16. Comments: WHOI buoy recovery in progress. The R/V REVELLE was positioned roughly 100 meters upwind from the anchor position. The acoustic release was fired and it took approximately 40 minutes for the glass balls to come to the surface. Once the glass balls were sighted the small a line was attached and they were pulled to the stern of the ship. The line was threaded through the A frame, the winch hauled the glass balls over the stern of the boat. Once all the glassfuls were onboard the process of uncoupling them to the mooring began, they were then loaded in groups of 4 into the shipping container to be sent back to WHOI. With 38 different sensors on the mooring it was a very long day just recovering all of them. Once most of the sensors were all onboard and labeled they began the recovery of the buoy and the last 12 sensors. The small boat was deployed and a line attached to the buoy. The ship’s knuckle crane was used in this part of the operation and the buoy was lifted and secured onto the port side of the ship (see photos). Once the buoy was secured the retrieval of the last instruments began. Again, labeling and photographically documenting the condition of the instruments was essential. In the photos you can see the increase in bio-fouling as the instruments get closer to the surface. The current meters nearest the surface were heavily clogged with fishing lines and although their temperature sensors were still functioning, the portion that measures the current direction and speed was completely jammed with the fishing line. Although acoustic current meters are also used on the mooring, there has been some issues with the quality of their data and the mechanical current meters are still the most accurate, but they have the problems of being more susceptible to bio-fouling and interference with fishing gear. This emphasizes the need for redundant instruments for data collection and comparison. Each year the sensors are evaluated and some changes in instrumentation and slight changes in buoy location might be made. For example this year the buoy will be moved a little farther away from last years mooring to hopefully decrease the likelihood of being tangled by fishing lines. After all of the instruments were secured onboard and labeled and photographed, the cleaning began (see photographs). Everyone participated in this phase with scrapers and , finally the power washer. All of the instruments needed to be cleaned and many stored in the main lab for data analysis tomorrow. All day tomorrow Nan, Lara, Jeff, Jason and Dr. Weller will be downloading and loading at the data from the sensors as well as preparing the new equipment for deployment on Wednesday. We are at the STRATUS buoy from last year and are preparing to trigger the acoustical releases so that the glass ball floats will bring up the instruments, almost 50 of them! it will take about 40 minutes from triggering the release until they surface and they the retrieval will begin in earnest. We will spend the day bring them all aboard, recording the depth, serial number and condition of each of them before Dr. Weller’s group will begin downloading the data. Then we will clean them and begin to pack them for the return to WHOI. A little background on the project first: The purpose of the cruise was to recover and then deploy a well-instrumented surface mooring under the stratocumulus clouds found off Chile and Peru in the vicinity of 20’S and 85’W. The mooring has been deployed for for 3 years as a component of the Enhanced Monitoring element of the Eastern Pacific Investigation of Climate ( EPIC) programs. Cruises for recovery and redeployment have occurred each October or November. The science objectives of the Stratus Project are to observe the surface meteorology and air-sea exchanges of heat, freshwater, and momentum, to observe the temporal evolution of the vertical structure of the upper 500m of the ocean. This year the Stratus project was joined by the ETL/NOAA group out of Boulder, Colorado. The Environmental Technology Laboratory people are meteorologists who are looking at the formation of the stratocumulus clouds that are formed off the coast of Chile and Peru. They brought and are using cloud radar and radiosondes to look at these phenomena. The Stratus moorings carry two redundant sets of meteorological sensors and the mooring line also carries a set of oceanographic instruments. Although Acoustic rain gauges were deployed on the last 3 moorings, this year there will not be one on the buoy and there will be several more current meters and temperature gauges. The Chlorophyll sensors will not be on the new one either. Most of the equipment , including the new buoy, was loaded on the R/V REVELLE in San Diego with some of the equipment being shipped to Guayaqil, Ecuador and loaded onboard in Manta, Ecuador. The science party flew into Manta to meet the ship and we will fly out of Arica to return to the U.S. On November 15, we stopped to lower and test the acoustic releases to be used in the mooring. They were lowered to 500, and 1500m depths. Jason Smith (WHOI) communicated with the releases at each depth. After the release test two CTD casts were made to 4000m. When we arrived at the buoy mooring ship and buoy data comparisons began. This is a check to see whether the sensors on the mooring are still calibrated. At 7:20 the release of the glass balls was triggered and they should surface about 45 minutes later. The small boat will go out to put a line on the mooring and bring it back to the ship. The line will be secured on deck the the recovery will begin. As the instruments are brought onboard they will be laid out in the order they are hung on the mooring up the starboard side of the ship and photographed and labeled by depth and type of instrument. This is to document the condition of each instrument before cleaning begins. Most of the instruments are covered by barnacles and a host of other organisms, this is termed Bio-fouling. The bio-fouling is dominated by goose-neck barnacles. These are quite thick on the buoy hull and down to 30m; some goosenecks were even found down to 135m last year. These can be quite a problem for the data collection, for example: last year the floating SST on the buoy hull was stuck in the down position by the barnacles. This is why it is important to document the condition of the instruments with photographs so that when you are looking at your data and it suddenly changes or stops you might get some clue as to why the flow on the current meters changes significantly in one of the sensors ( bio-fouling for example). We will finish recovery of the instruments today and tomorrow will recover the buoy late today.